Sain Ericiltä kameran lainaksi ja oon saanut viimein dokumentoitua kaikenlaista kotiolosuhteissa. Yksi viime viikkojen projekteista on ollut Boba Fett-kypärä Empire Strikes Back-leffasta. Olen kirjoitellut englanniksi maalausprosessin kulusta eri foorumeille, joten nappaan tekstit suoraan tähän! The inspiration. 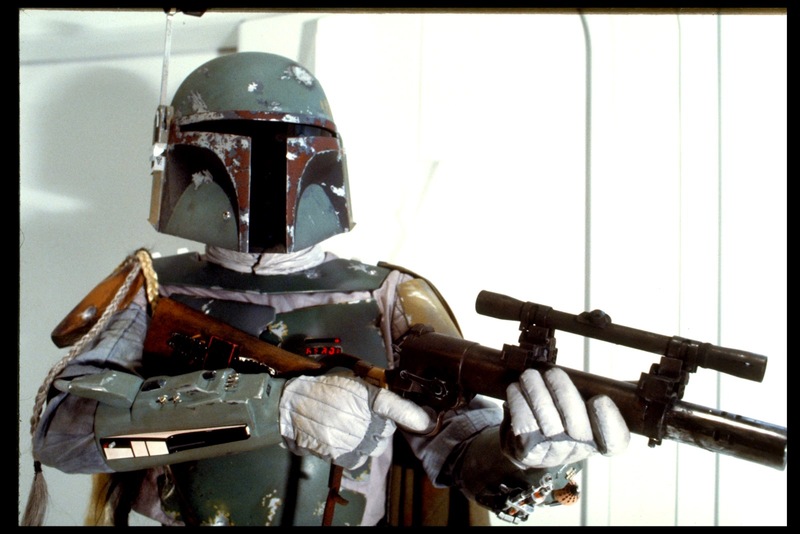 But what do you mean "no disintegrations"? In the trooping or cosplay scenes the helmet is often the most important part of a costume and people put a lot of effort, time and money to their "character faces". My original Fett helmet came as a part of a larger package from a retiring swedish collector a couple years back and back then I really didn't notice any faults. However Don Post Deluxe helmet is not known for precise features or very accurate paintjob. It's more like a nice collector's piece, something for display and of course an important part of Fett helmet history. This was the reason I didn't want to do any modifications to it, because of it's collectable value, no one knows how many unmodified and fine-condition Deluxes exist anymore. The helmet was good sized for me and even the paintjob could've been "good enough" but the visor inaccuracy made the upgrade clear as I finally realized what was wrong with the helmet. It creates a whole another kind of look and effect when the visor is deeper in the helmet. A new helmet then. I recently purchased a BM helmet from TDH's sale area Cargo Hold. This one was in mint condition except the important Dent detail had been exchanged into a bit more accurate (I think) one from American promaker FP. I love the BM's durable finish and the opportunity of getting prepping and painting it immediately without need to do a whole lot of cleaning first. I was very happy with the acquisition. Just a tiny flaw; the other cheek and mandible courve seem to be warped a tiny bit, I need to figure out a way to straighten it somehow or then just leave it as it is. I have to admit, I was scared sithless to start painting this helmet!! The armor was child's play compared to the complexity of a layered Empire Strikes Back-themed paintjob. For the painting project I hunted down every template I could get and then compared these to each other and some of the pro paintjobs I had seen. Now that I have already started painting I can't believe how skilled and precise these master painters are, as it seems impossible to replicate every little scratch and chipping detail, yet they do. Hats off to them, crazy. This was my first go at painting a helmet and I tried to do it as well as I possibly could, with the time and resources at hand. This is how the helmet was pictured in it's original sales thread. Mine! First stage, silver basecoat completed. As you can see, the right-hand side mandbile is a bit higher than the other one, creating an uneven look. I think it might work if I just bent them at the same level when hotgluing or bolting the visor inside and it would hold them at place. Here's some of the tools I'm using. Winsor&Newton's liquid masking will be used for covering weathering details as new paint layers are applied. I chose Vallejo's Model Air series because of their availability. I can get these from the local hobby store without any external hassle. Ordering paints from webstores has proved to be a hit and miss gamble and personally I'm not doing it anymore. Aaaaiee, first coat! Even from the templates it's pretty damn hard to determine in what exact order the different coloured paint layers should be on top of each other. This is the first, light layer upon masked silver battle damage. By the way, all colour hues in these pictures will be off, as my camera was made long long time ago (and probably in some other galaxy as well). Peeling off masking, laying down a new one, another layer of paint and peeling off the mask again. It's like the most rewarding feeling in the world to rip off the masking coat to reveal the chipping details underneath! This is how it slowly starts to resemble a finished product. Some people do the paintjob in a "topical" way, meaning that they lay down the green base color of the helmet and then paint all the scratches and damage on top of it as it's easier and if the layers are thin, no one will see the difference. I wanted to do a layered paintjob however, as it's more realistic and that's how it was done in the movie as well. Going greenside with Vallejo Panzer Olive and some bone color highlights! Side angle. Battle damage was pre-weathered with Devlan mud brown. Peeling off the masking, the best part! Another shot with a bit different camera settings. This day I just kept running into problems with the paintjob. It seems that either the basecoat was too thin (should've used spraycan) or the liquid masking sticks really hard if left dry for a longer period, because when removing the masking it peeled every paint layer, including the silver basecoat off at places. I ended up redoing much of the mandible red because masking left wide unpainted areas here and there. There's still some paint layer edges peeling off and though it looks realistic and cool, I hope the clearcoat varnish will seal it all in place. I used Vallejo Model Air Rust color as basecoat and Fire red as the highlight color. I then shaded it with 20-80% mix of Games Workshop's Devlan mud and Leviathan purple. I'm going to scrape some sharper details with a sculpting tool later, to make those tiny scratches convincing. The menacing leer... It's there even without the visor. Still looks so wrong without the black cheeks. ESB all the way! This day after lessons I headed downtown to get a black and white airbrush colors that I forgot to buy on the first time. Today was a cheek day and I masked the already painted, surrounding areas with tape and liquid masking. I didn't figure any smooth and convenient way to trace the cheek curve between black and green areas so I just did it freehand. Before starting with grey and black colors, I redid the silver base as there was some red areas that had spilled out from mandibles. Time to hit the grey. After the grey coat I removed the silver damage masking to get the grey color surroundings right and then masked the silver parts again. I was a bit worried that I'd accidentally peel off the masking separating green zones from the black cheeks when removing the silver damage masking, but fortunately it stayed in place. When doing multiple layers with silver underneath I usually sketch the damage shape a bit bigger than that it actually is and shape it better just before the last coat (in this case black). Hit it with black and BOOM, badass ESB look achieved! Still miles to go with the finishing but now it's already visible where we're going. Cheeks are still unweathered, some darker shading will blend the green and black cheek areas better into each other. I think when everything else is ready, I'll give the helmet a couple of thin, dark washes to tone everything down a bit. More scratches still need to be scraped to achieve the final look. The grey areas on the green cheeks need to be added topically as I missed them on the first go. After I had carefully covered the surrounding areas I painted the ear piece with Vallejo Fire red. Then I did the red damage masking. Silver coat and new masking. Green shade is Vallejo's Pale Green, that I shaded with Devlan mud in places. The look with liquid masking removed. I then masked the ear piece to paint the white logo detail on. Two layers of airbrush white and we're set. Some more Devlan mud weathering and then I got to remove the rest of the masking. Another ear piece, another silver undercoat. Model Air bone color and some Gryphonne Sepia and Devlan Mud shading. The Black & White details I did freehand with a brush. Finally I got to do the kill stripes. I masked the surrounding areas with tape and plastic bags and then cut even pieces out of some stickers to cover the spaces between the stripes. Unfortunately I somehow broke the aibrush compressor before I got to apply the fading into orange... I guess I need to do that later somehow. 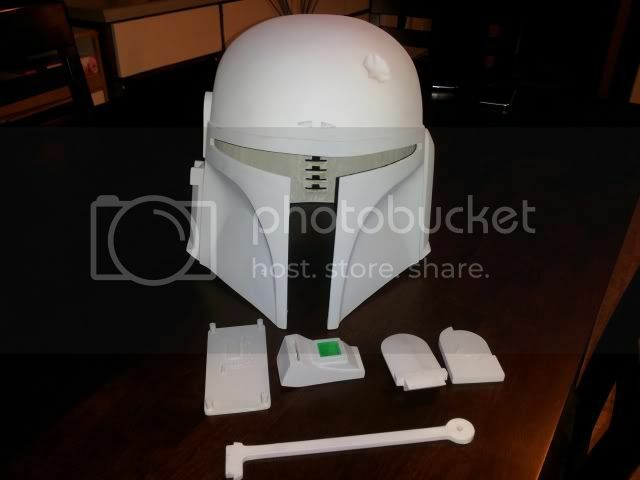 There's still a lot of weathering and small details to do, but I think it's pretty cool already and it's fair to say that everyone and their mother should recognize it as a Boba Fett helmet. ;) I'll later add a black and dark green washes to tone everything a bit darker and to give the bucket a battleworn look. Here's the thing on a display bust. As you can see, the rest of the armor green is a bit deeper colour. ...and this side as well. Need to add some more chipping damage too! "I'm sorry but I cannot hear you over the sound of how awesome I am..."
Rangefinder and ear pieces are not attached yet, but I put them together with blu-tac for the pics. The visor also has to be glued in place. A comparison shot with my old, factory-painted helmet. It's time to change! The next pics with the finished helmet should be full-armor ones from Model Expo where 501st Legion's Nordic Garrison collects funds for children's charity. Perhaps I'll see you guys there. :) Thanks for looking! Who could've known? So much better! Good work and well written story. tthv. Kiitti tyypit. :) Polttelee lumien sulamisen myötä päästä jo pitämään kunnon teemallinen Fett-photoshoot! within fact, sleep apnea professionals state which the success associated with Mask CPAP models therapy is usually contingent on to air pressures the patient may tolerate AND a great comfortably fitted sleep apnea mask.This article discusses why very well masking a good vehicle sooner priming or perhaps painting is crucial.